Great question. Moore’s law cannot be applied to battery technology due to space issues. Computer processors and chip performance doubles roughly every 2 years, and this can be achieved as they use electrons to store information. Electrons are sub atomic particles that surround a nucleus of protons and neutrons. They are so small, that they don’t use space within a computer chip and manufacturing techniques can make chips smaller and smaller without issues. Batteries work with power as opposed to information, and use ions to transfer charge. Ions are atoms with a charge associated (+ve or –ve) and do take up room, alongside the electrolyte material sandwiched in between the anode and cathode. So generally speaking, a battery 5 times smaller will supply around a 5th of the energy. As for price, Lithium batteries are more expensive than alternative battery technology, but perform better so are preferable. Is it economically possible for not only batteries but all electrical devices to be charged by ordinary home lighting so they can keep their charge? 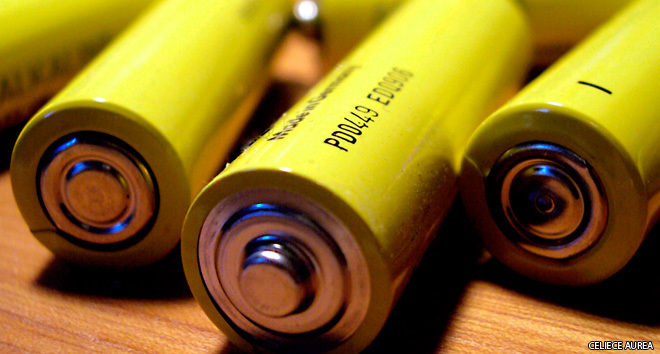 How many times can rechargeable batteries be recharged? The problem with charging devices from home lighting is that of inefficiency. There are quiet a few losses from putting energy into the lighting, to getting energy from a solar charger. The amount of energy you would receive would be negligible and I fear wouldn’t even keep a device topped up. What is your average lightbulb rated at; 40 Watts? Not a lot of this will actually be absorbed by the solar panel, it will be bouncing around lighting the room, or heating up the bulb. The sun however, (on a good day) gets around 1000 Watts of energy per square meter to the ground. So it would make far more sense to get a bank of solar photo-voltaics on the roof outside and use the sun to run the electricity in the house. Then you could just plug in your charger and still be ‘green’. It is my opinion that the USABC and CARB are responsible for the slow pace at which battery technology is released to the public. It is the fossil fuel industries interference in regulating bodies that have kept us in such a low efficiency state.